Someone asked me that on twitter last week having stumbled across my blog and some of the posts I have made. What a brilliant question. Its been a little while since someone has asked me something that has felt so deep, something I so desperately wanted to respond to with an answer immediately, yet that I also had to go away and consider. My initial response was this ‘scary yet wildly exhilarating and exciting’. And whilst I have tried and tried over the last few days to come up with something as deep in response, I have not been able to. The only answer I have been able to come up with, and continue to come up with is that. Its scary. Yet it is exciting and exhilarating. The reason they asked that was because they read something I had written a bit back, that talked about ‘4 years since …’. Because 4 years ago, I wanted to die. Seriously wanted to die. In fact I was devastated that I didn’t when I tried to. If you look back into my blog (you wont have to go that deep) you will find various writings which talk about that experience. That desire and longing to be dead. That feeling of hopelessness, darkness and complete brokenness. It was inconceivable that anything could or would change. My heart had broken and it felt like it would and could never be fixed, mended, put back together again. Why am I writing about this again? Because today is World Suicide Prevention Day 2012. You may have seen people tweeting about it, face booking, blogging. I have been truly moved by the many many different things I have read today. Peoples experiences, lives and families. Every year on the 10th September is the World Suicide Prevention Day. And this year marks the 10th anniversary of that day. 10 years of research, prevention and education. * Data from the World Health Organization indicate that approximately one million people worldwide die by suicide each year. * Suicide is estimated to be under-reported for multiple reasons including stigma, religious concerns and social attitudes. In just those few things are some really worrying and sad statements. True though. And so today serves as a day to remember those who have died, those who are considering it, and those who have come through it. It is a day to remember and think about those who have been effected by it, even if they themselves have not attempted suicide. Because for every person these facts suggest, is a family. Is someone who loves them, knows them, has at some point been in contact with them, and therefor are also affected. As I wrote several years ago, on this day, in 2010, before I ever got to a point in my own life where suicide felt like the only option, I had already come into contact with it. Already knew someone who, when I was a young person, and they were my youth leader, felt their life could not go on. And it didnt. They hung themselves. I’ll remember to this day, that day we got a phone call to tell us he had died that morning. I was a teenager. His wife was left, with two young children. His parents were left. His family, friends. It affects everyone. Today serves to raise awareness. Of the issues. Of the fact that so many people out there live in darkness, real torment. A life of no turning around. No where to run. No where to hide. No where o seek solace. No where to find peace. No where to find rest. There is no choice for them. Actually, there is, one choice, the only choice. To die. For then may their souls finally be still. We must begin to/continue to speak out about this issue. Not be frightened to address it. Not be scared to utter ‘suicide’. We must bring it to the forefront of conversation. We must not be scared to open up the ‘box’ so to speak, and to allow people to explore the topic. We need to be aware. As some of you who follow my twitter feed may remember a few months ago I spoke in an evening service at church. And I was frustrated, and hurt more than frustrated by the criticism I received straight after by the minister for mentioning ‘suicide’. I spoke about a different theme but mixed in with that some of my own story, to which I bought up the fact I had wanted to die. He had felt in ‘inappropiate’ because some young people 15/18 year olds were in the room who have had a family member commit suicide when they were very young. The young people themselves were fine. The vicar wasn’t. My impression was that he was uncomfortable with it. Which has been my experience of church generally. Whether thats because they choose to be uncomfortable with it, or because lack of knowledge and understanding leads them into fear, I don’t know, but I do know it needs to change. We must not/cant be afraid to talk about it. We must change perception and stigma. And today is part of that. Its been moving to see people posting many things online, and to see a movement of people coming together with one focus in mind. To raise awareness or suicide and the prevention of it. What we must make sure of though, is that today is not a stand alone day. That those people who have tweeted, written, talked about and passionately ‘involved’ themselves in the conversation continue to do so after today. For people like myself, and others affected, it does not go away after ‘one day’. I was really moved to see a friends picture of her wrist today. 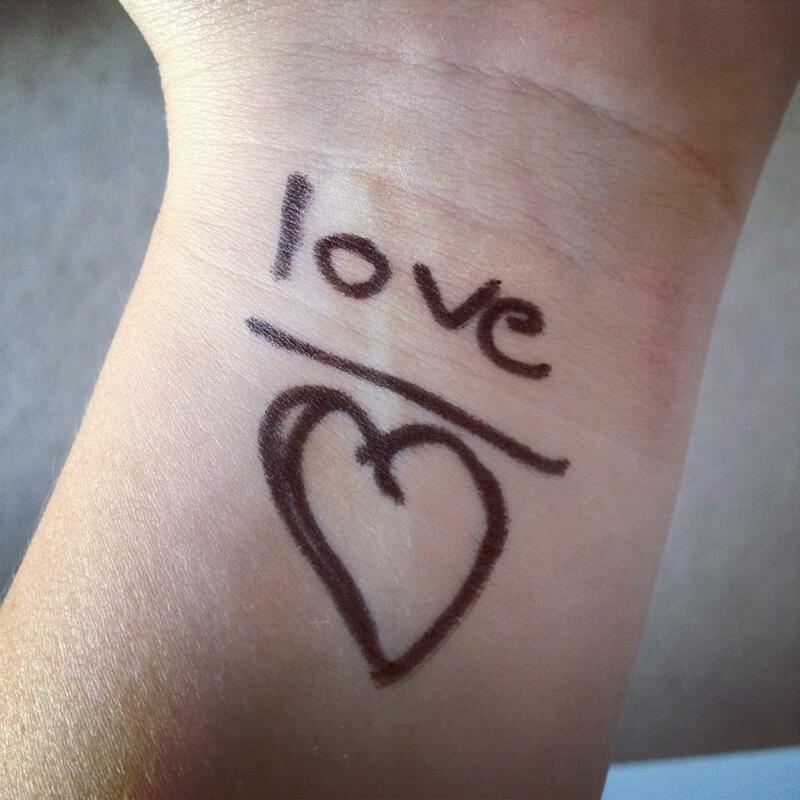 With many other people, she marked her wrist with the word ‘Love’. As a sign of solidarity. Thanks Jasmine for letting me share this here. So simple yet so moving. Lets keep moving on with this issue. With trying to understand it, and working out how we can support those people around us who feel there is no option other than the final end. The other thing I have seen today, which moved me incredibly, to tears in fact was this blog, which you can see below called Suicide isn’t Painless by a friend Andy. If you can, please take the time out to read this beautifully vulnerable writing. and this is also from his blog. Today I thought I’d shove it all, Pull the plug and say goodbye.The pain I bore was much too strong, I had no tears left for me to cry. I didn’t really want an end, Just a place to have a rest. I couldn’t take another step, Convinced myself ’twas for the best. A friendly face interrupted me, And spoke of love and peace. And held my hand, and wiped my tears, And soothed ’til thoughts did cease. Others have gone before me, and some have not come returned. And others still will not make it, despite all that we have learned. Suicide isn’t painless, and it doesn’t solve a thing. It leaves behind all sorts of scars, and banishes hope of spring.